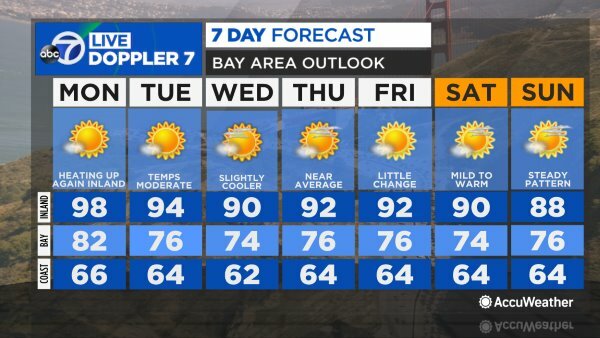 Weather Anchor Spencer Christian has your Bay Area AccuWeather forecast. Tonight will be clear and mild, with overnight lows mainly in the mid-50s. Tomorrow and Wednesday will be sunny and much warmer than average. Highs will range from low 70s at the coast to mid 80s near the bay to around 90 degrees inland. Coastal cooling will bring temperatures down a few degrees later this week, and a closer to average range of temperatures can be expected by the weekend. Mostly sunny days will dominate our weather picture for the week ahead.